Two types of non-symbiotic hemoglobins (nsHbs) have been detected in angiosperms: nsHb-1 and nsHb-2. The origin of nshb-1 and nshb-2 prior to the monocot-dicot divergence was a major event in the evolution of land plant nsHbs. Because nshb-2 has not been detected in monocots, apparently only nshb-1 exists in monocots. Here, we report the phylogenetic analysis and in silico characterization of novel monocot (barley, Brachypodium, foxtail millet, maize, rice, sorghum, switchgrass, and wheat) nsHb sequences deposited in databases. 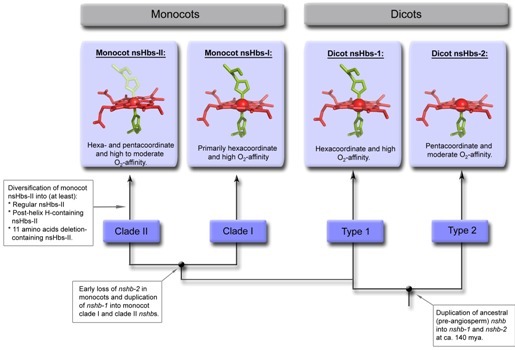 Results suggest that only nshb-1 evolved within monocots; that nshb-1 duplicated early in the evolution of monocots, originating clade I and clade II nshbs (nshbs-I and nshbs-II, respectively); that nsHbs-I correspond to dicot nsHbs-1; and that nsHbs-II diversified into regular nsHbs-II, post-helix H-containing nsHbs-II, and 11 amino acids deletion-containing nsHbs-II. Molecular modeling showed that monocot nsHbs-II may fold into the myoglobin-fold and that Fe-heme is hexacoordinate in the predicted barley, Brachypodium, maize, and sorghum nsHb-II and pentacoordinate in the predicted foxtail millet, rice, and switchgrass nsHb-II.